Earth Cross Section was an interactive science exhibit I designed and built for the Kayseri Science Centre in Turkey when I worked at the Exploratorium. 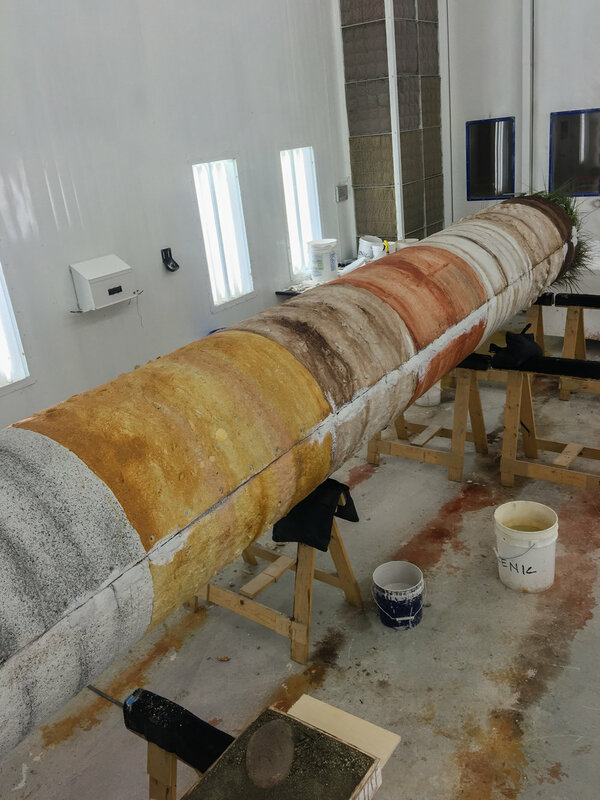 Visitors were invited to hoist themselves up and down along a 25 foot tall model of a soil core sample. Question and answer graphic panels and the ability to engage the tactile senses gave visitors a unique experience based in inquiry and curiosity. In my role as the lead engineer and technical designer, I led the design engineering, fabrication, and installation of the exhibit. With the conceptual design by Dutch designers, and the exhibit ultimately going to Turkey, I had to navigate the tri-cultural client relationship and expectations in addition to upholding the Exploratorium’s underlying obligation to inquiry based science education. 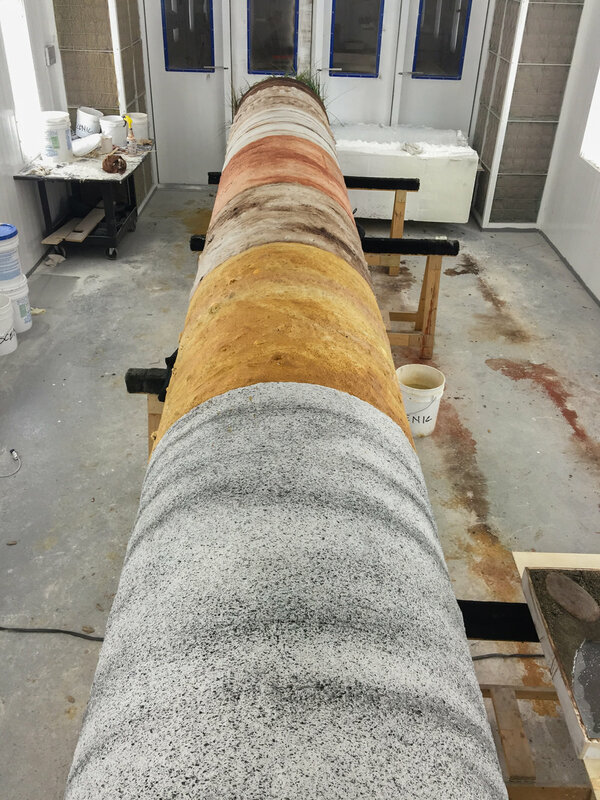 The soil column design was done with much research and consultation with Turkish geologists and Exploratorium staff scientists. 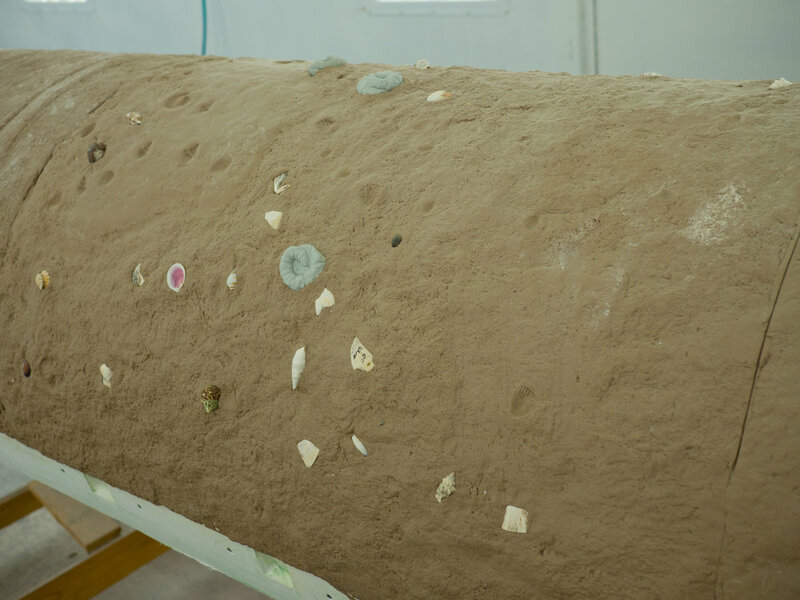 The goal was to portray an accurate representation of the types of soil layers found in and around Kayseri. The soil column was fabricated in two halves, to allow it to be assembled around an existing support beam in the museum building. 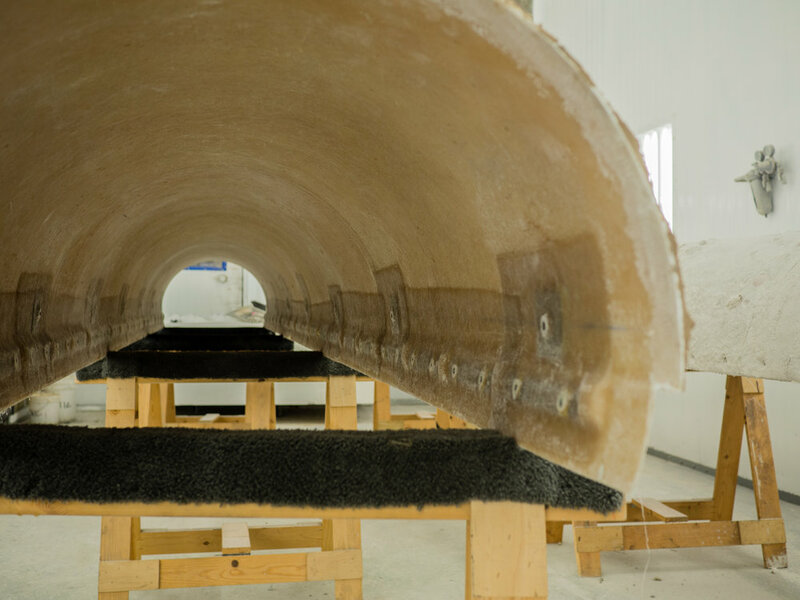 Threaded fasteners were embedded in the fiberglass shell of the soil column and used to join the two halves together and to attach to anchors clamped onto the building beam. The seat restraint was adapted from an off the shelf racing harness, modified with a custom cover plate and enclosure that required a special spanner wrench to unlock in order ensure that only the exhibit attendant could unbuckle the rider. Various belt configurations were also tested to determine the ideal interaction for both the visitor and attendant. The trolley was designed with safety and stability as the main factors. Reliability as well as the ability to access and conduct maintenance on the trolleys were also goals of the design. The trolley frame was made of steel with polyurethane rollers as guide wheels. The trolley was assembled one side at a time around the guide pole and then tightened in place using a ratchet strap. The upper trolley was connected to the counterweight and hoist cables using wire rope fittings. Lastly, a steel shroud was installed to cover and protect the trolleys. The capstan winch pulley. The rope is wrapped over once to increase the grip. The hoisting mechanism consisted of a continuous loop of rope between two pulleys, one anchored to the floor and the other, a large diameter capstan winch, at the top of the exhibit. The capstan winch was connected through a shaft to a large sprocket, which used a chain link to drive a mechanical hoist that lifted the seat and trolley assembly. A counterweight running along the inside of the soil column was connected to the seat using a cable routed along the outside of the frame of the exhibit. 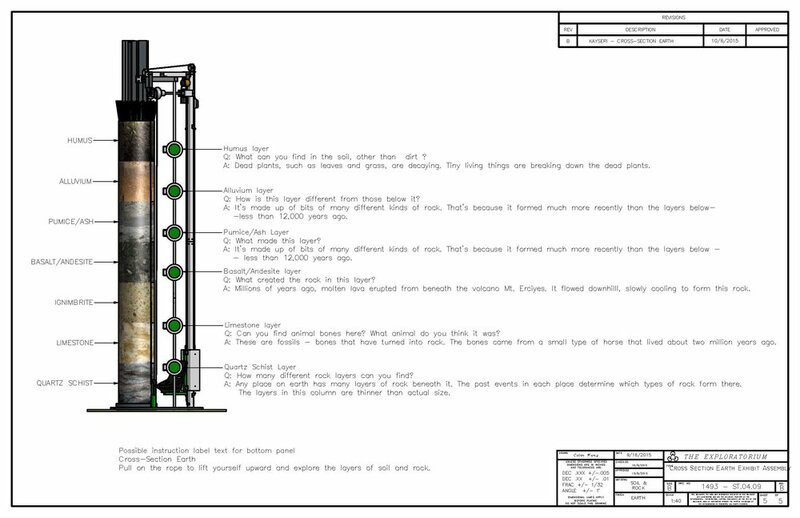 There are six graphic panels along the height of the soil column, each with a question on one side and the answer on the other referring to different layers of the soil column. The graphic panels use a gravity cam mechanism to return to its initial position. Magnets were pressed into the apex of each cam, oriented so that the matching poles repel each other and assist the cam return. Prior to shipping the exhibit to Turkey, a dry run of the assembly was done at the Exploratorium in Pier 17. This was a necessary but very difficult task, due to the limited space options for where to erect the exhibit. The rafters of the pier shed were also an obstacle and required a fair amount of improvisation and maneuvering by the project team. Outside of the Kayseri Science Centre. Photo from Google. The Kayseri team: Daniel Bering, Sarah Wilson, Chris Dang, Steve Day and the rest of the engineers. Tim Oliver of Kreysler & Associates and Megan Stewart of Group Delphi for their help with fabrication of the soil column. Joel Hirschfeld and crew for welding and fabrication of the steel components. Paul Troutman and crew, namely Billy Collister and Tom Wray for their help with the installation on the ground in Kayseri. Fahri Turan and crew for their help with installation and as our Turkey based liaison.